Recasens acrylic canvas fabric is water and mould repellent and will last a very long time if maintained well. However, over time, the accumulation of dust, pollution particles, organic plant matter, pollen and general dirt can embed itself into the fabric and shorten the life of it. It is a good idea to periodically give your umbrella fabric a light brush down with a soft bristled brush/broom and water from a garden hose. This will help to dislodge and remove loose dust and dirt that has settled on the fabric before it can embed itself more deeply. Although mould will not grow directly on clean acrylic canvas, as dirt and organic matter embeds itself into the fabric the mould will be able to grow on the embeded dirt and organic matter, so it is best to remove dirt earlier. Depending on how often you use your umbrella, you may eventually need to give it a more thorough wash to remove any embedded dirt or early signs of mould growth. To do this you will need to mix warm water and mild soap or mild dish washing liquid in a bucket. Use a soft bristled brush (or a long broom) to generously work this soapy water into a lather over the umbrella fabric. Focus mostly on the areas with the most dirt or stains, then allow the soapy water to soak into the umbrellas fabric. Once you are finished soaking the umbrella fabric, rinse it thoroughly with a hose until all soap residue is removed, and then air dry the fabric. If you have heavy dirt or mould growth in your acrylic canvas fabric and the instructions above have not removed it, you may need to repeat the instructions again, but add between between half and one cup of bleach to the bucket of soapy water. The acrylic canvas fabric used by Shade7 should not fade or lose colour when using bleach (diluted with water) when cleaning. Feel free to test the bleach mixture on the canopy strap first to check that there is no colour loss. The best way to remove heavy dirt and mould is remove the canopy from the umbrella and soak it in warm water with something like bleach or “Napisan”. You might need to change the water and repeat this process until all the dirt or stains are removed. It is then essential that the fabric is thoroughly rinsed with water to remove any bleach or Napisan. A good way to do this is to put the fabric through a gentle machine wash with cold water and washing detergent. Once this is done, put the umbrella fabric back on to the umbrella wet and then allow to air dry. Depending on how old the acrylic canvas is and how thoroughly it has been cleaned, you may want to re-treat the fabric with a product like 303® Fabric Guard. 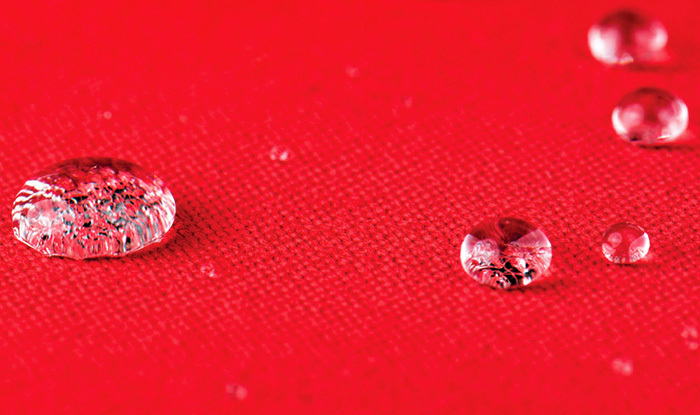 This will replenish the fabric’s water repellency, causing water to bead off again and will also help to repel dirt and dust from embedding into the fabric. Shade7 uses the finest marine grade solution-dyed acrylic canvas fabric manufactured by S.A. Recasens in Spain. This premium outdoor fabric has the best available colour fastness rating of 7-8 out of 8*. Recasens fabrics also has the highest possible UV protection rating of UPF 80 according to the European UV standard 801, cutting out the maximum amount of harmful UV light for excellent sun protection. Recasens fabrics are manufactured with only the highest quality raw materials and the most rigorous quality-assurance procedures. Recasens fabrics are covered by a 7 year residential warranty (5 years for commercial use) covering rot and colour fading* in normal environments and conditions of use. The warranty does not cover wear and tear or wind related damage. *Colours with red pigmentation (red, orange and yellow etc) will have lower colour fastness than other colours and will show some fading earlier. Click here to learn about how to maintain your outdoor umbrella.